To understand why the amount of oil stored in the ground is finite, and the amount that we can retrieve is even smaller, we need to review how oil forms and how we recover it from the ground. The oil stored within the earth initially formed hundreds of millions of years ago when plants used photosynthesis to store the sun’s energy, died, were rapidly buried, and transformed under heat and pressure into oil. The energy stored in oil molecules is therefore ancient trapped sunlight. Oil can form from buried plants only under special conditions in the oil window at approximately 3-6 km depth, and only when oxygen is not present to react with the carbon to form carbon dioxide (respiration). Oil is usually found only in sedimentary rocks that are less than 500 million years old, because land plants did not exist before that time. Because oil takes millions of years to form, it is considered a non-renewable resource. Oil source rocks are the fine-grained organic-rich sedimentary rocks, usually shales, where oil forms over millions of years. Because it is a low density fluid, oil does not usually remain in the source rocks but tends to migrate upwards through permeable rocks. A reservoir rock such as a sandstone or coral reef has sufficient permeability to let the oil flow into it and porosity (empty space) to store the oil. An impermeable cap rock, often salt beds, can trap the oil beneath the surface. Petroleum geologists look for oil in places where cap rock (salt) lies above potential reservoir rock (sandstone), which in turn lies above potential source rock (shale). Because oil is “liquid gold,” oil companies have spent billions of dollars perfecting techniques for oil exploration and recovery. Over time, exploration shifted from the surface to the subsurface. Each drilled well provided information about the subsurface. From drill chips, geologists could identify rock types and microfossils and assess their potential as source, cap, or reservoir rock. After drilling a series of wells, a geologist could interpolate the subsurface structures (sedimentary layers, faults, etc.) between wells so they could estimate the depth of reservoir rocks in undrilled locations, and therefore how deep they would have to drill a potential well. To improve their oil-finding capabilities further, oil companies developed methods for wire line logging, gravity surveys, and subsurface seismic profiling that greatly increased the success rate of expensive drilling and allowed exploration geologists to find small patches of oil at great depth. These techniques greatly lowered the costs of exploration; they also greatly increased the amount of oil delivered to the market. Both factors helped to keep the price of oil low. These techniques were so effective that oil discoveries skyrocketed until 1965 (Figure 1) but have fallen ever since, suggesting that most or all of the abundant oil supplies have been found. Figure 1. Crude oil price per barrel (2009 U.S. $) over time. 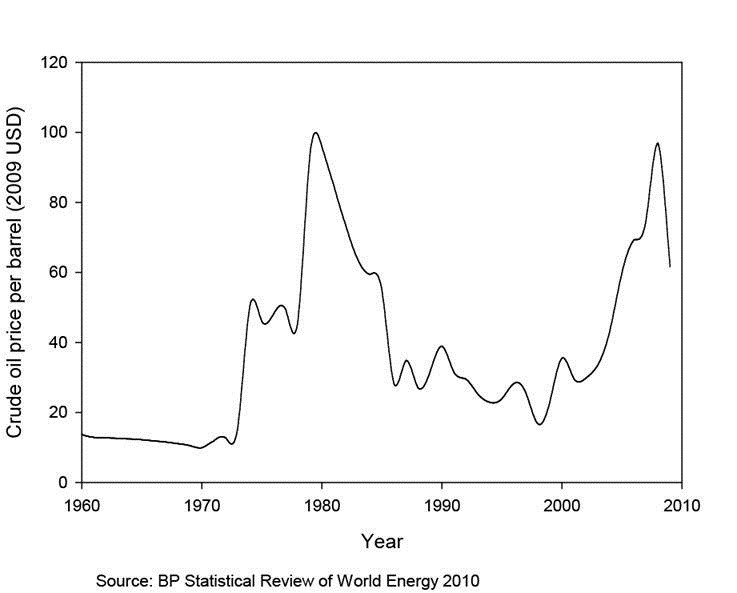 Data from BP Statistical Review of World Energy (2010). Experts debate how much oil remains, and how much we can recover. In his book “Hubbert’s Peak: The Impending World Oil Shortage” Princeton geologist Kenneth Deffeyes (Deffeyes 2001) claimed that the total recoverable amount of oil was 2.1 trillion barrels in 2001, and that we had used roughly half of that, so that roughly 1000 billion barrels remained. In 2006 we consumed oil at a rate of 31 billion barrels per year. 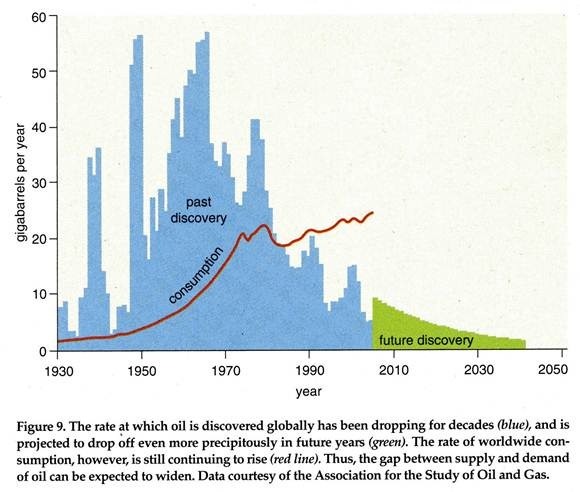 If that rate remained constant, it would take 1000/31 or ~32 years from the time of Deffeyes’ estimate to consume all of the remaining oil, i.e., we would deplete oil reserves by the year 2033. However, the oil consumption rate is increasing exponentially because population is increasing at an exponential rate. Furthermore, it is not the timing of ultimate exhaustion of the resource that concerns us, but the timing of peak oil production. 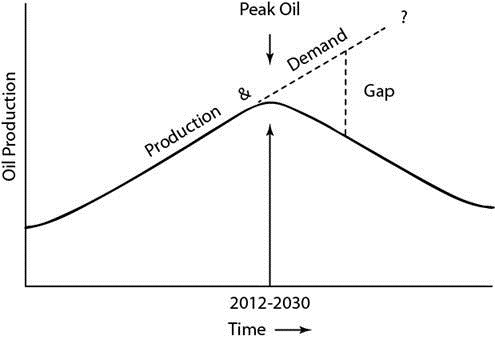 After oil production peaks, a gap will develop between continuously increasing demand and decreasing supply, and the price of oil will skyrocket (Figure 2). This will occur well before ultimate depletion occurs. Figure 2. Peak oil and the supply-demand gap. After Keller (2010). The prospects for finding large new oil deposits to erase the supply-demand gap are not good. Theoretically we can recover large amounts of oil from smaller oil fields, but it is not economically feasible; oil companies make most of their money from giant oil fields. Today ~85% of total production comes from less than 5% of production fields (Deffeyes 2001). Oil companies made all but two of the major oil discoveries before 1940, so the rate of discovery of large oil deposits (spikes in (Figure 3)) has greatly decreased. Enhanced oil recovery is also unlikely to significantly increase supply. Primary recovery, which uses natural reservoir pressure, extracts no more than 25% of the petroleum in the field. Enhanced recovery, which requires manipulating the reservoir pressure by injecting gases and liquids, extracts up to 50–60% of the petroleum. Despite more than 50 years of research on how to improve recovery rates, we still leave more than 40% of the oil underground. This is unfortunate, because worldwide we are now abandoning more wells than we are drilling. This entry was posted in Energy, Fossil fuels, Peak Oil, Sustainability and tagged Energy, Fossil fuels, natural resources, Peak Oil, Sustainability. Bookmark the permalink.